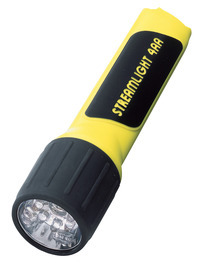 Streamlight ProPolymer 4AA LED Light measuring 6-1/2 in x 1.63 in x 1.34 in offers a run time of 155 hr including seven 100000 hour life LEDs of 67 lumens rating. Light with waterproof and wrist lanyard connection includes unbreakable polycarbonate lens with scratch resistant coating and a momentary blink or constant on tail switch. Light has a impact resistant polymer case material featuring a impact and shock resistant, rubber face cap. Light requires four AA size alkaline batteries.